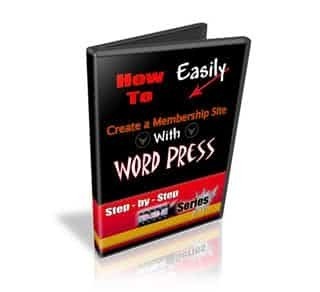 Discover in less than an hour how to create a wordpress membership site. Establishing a passive income stream is the key to building fast reliable wealth. Those sorts of words get tossed around really easily these days, I know. They usually relate to some fantabulous new special-secret-tricky-tactic, invented by a pre-pubescent marketer in his mom’s basement. After making a few grand with this “secret,” he’s capitalizing on his one-time success by releasing it as the greatest thing since sliced bread. The problem is simple: those types of success stories are based on luck, not on reliable and repeatable marketing techniques and business models. You know it and I know it. Every few years some lucky loser pulls the handle on a Megabucks slot machine and becomes an instant millionaire…that doesn’t make them qualified to release their “strategy” for “beating the slot machines” does it? Do You WANT To Become Really Successful? Do You WANT To Actually Become Financially Independent? Are You Will To Try Something That Has Been PROVEN To Work? Even If It Means NOT Sucking Into The Latest Marketing Fad? Good, then you’ve come to the right place. What I’m going to share with you is proven, not new. It’s an age-old business model that works, not a new “theoretical discovery” that’s shiny and new. In fact, promise me that you won’t waste your money on something new and nifty until you invest your money in something that’s proven to be profitable, alright? The people who have achieved real, lasting wealth online are the people who have a monthly membership model at work for them…twenty-four hours a day…seven days a week…three-hundred-sixty-five days a year. Ah, membership-only websites. The most recent version of the oldest ongoing income building technique in the world. Why is a membership-only website, with an ongoing monthly subscription cost, something you need to get up and going today? With nothing more than a WordPress site, which I’m going to show you exactly how to set up, you can experience true financial security. Imagine having 100 members paying $20.00 each, per month…what would you do with $2,000.00 a month income…every month? Imagine doubling your monthly fee to $40.00…$4,000.00 a month. Since your imagination is running, imagine having 500 members…$20,000.00 a month. Yes it’s possible and it’s being done right now. Your site can be managed and run with absolutely no employees and, thanks to the walk-through you’re about to gain access to, you can setup your site for less than $20.00…total. (WordPress and plugins are free. You need a domain name – about $9.00 and hosting – about $6.00 per month) This is the only real business opportunity in the entire world that can provide you with that kind of a return-on-investment. Thanks to the worldwide appeal of the Internet, you’ll have members from every corner of the globe. Imagine the excitement of having members come join your site…from places you’ve never even heard of. It happens every day and, soon, it’s going to be happening for you. Maybe you don’t realize that most membership site owners spend less than ten-hours a week maintaining their site. Really quickly, think about it…if you spend 10 hours a week…40 hours a month…generating $2,000.00 in income…that’s $50.00 an hour. If you’re generating $4,000 a month…that’s $100.00 an hour. Where else are you going to make that kind of money, month-after-month, from home? Even if you don’t have a single, solitary, product of your own…you can still generate additional income by recommending products and/or services to your members. Hooking up with other entrepreneurs allows you to harness the income skyrocketing potential of joint-ventures while simple affiliate links provide a reliable way to boost your income…whenever you want. Basically, if you’ve got a hobby or an interest…there are other people with the same hobby and the same interest who will be willing to pay you, every month, for a place to further their interests and meet other people who share the share it. Using WordPress as the foundation of your membership site just makes sense. While other sites charge you a small fortune for proprietary software that runs your membership site (until it randomly decides to not run your membership site…because, let’s face it, most software breaks down every now and then), WordPress is free. WordPress is also open-source, which means that some of the greatest programmers in the world are working together to keep WordPress running in tip-top condition at all times. They’re not being paid to take care of WordPress, they’re doing it because they love it. A decent web-based programmer can cost anywhere from $65.00 to $500.00 an hour, depending on their individual skills and ego. Many of them have a two- or three-hour minimum. Getting someone to setup this exact membership site for you can easily cost anywhere from $130.00 to $1,500.00. You’re about to have access to a fifty-six minute that shows you exactly how to do it for a fraction-of-a-fraction of that amount! Step-by-step instructions that will have your membership site up and going in less than one hour. The crucial settings your need to ENSURE are correctly established to keep your membership-only materials safe from the prying eyes of non-members. A super-easy way to maximize your membership profit by offering up to four different paid levels plus an optional free level. Cash in with many different currencies…You’re not limited to U.S. Dollars and you’ll see exactly how to set it up. Using “Custom Capabilities” to increase the number of packages you can sell. Let’s stop beating around the bush, shall we? Think about it: every minute longer you spend sitting here, reading about how fantastic your life is going to be once your get your membership site up and going is another minute that your life isn’t that fantastic! Get started on your membership right now.